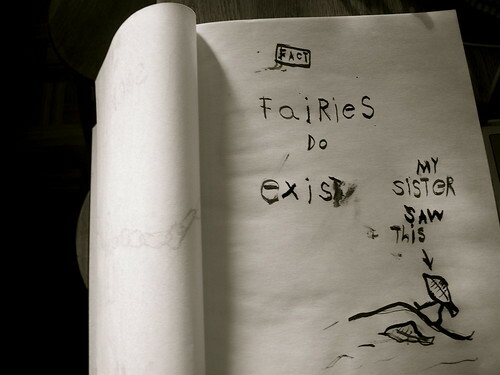 Fairies do exist . . . I found this amongst my many photographs that remind me of times past . . . It was taken close to two years ago when my eldest son was logging information about fairies . . . He talked about them constantly. His wee sized sister was in on the track, for even at five she realized the impact she could have if she had encounters with these somewhat elusive beings. To have information needed by this older, far more knowledge brother, was something she coveted and managed to work to her advantage. He would question her and take notes then quickly add them to his book of proof. I miss that era, it was magical . . . and not just because of the fairies. ← Previous Post After Dinner Walk . . .
Next Post → At the river . . .
That notebook is precious! Such cute boy writing and “facts' and all… what imagination!